I’ve been helping my good friend Lillehafrue copy some of her stories to Lunaescence Archives. She’s pretty upset (as am I) with the way FanFiction.net has added those interstitial ads that you can’t X out, and wants a new place to post her stories. Now, Lunaescence uses a variation on eFiction, a popular archiving software. Quite a few of the smaller (and a couple of bigger) archives use it. 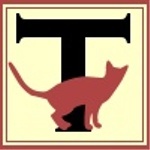 The trouble is: it’s nothing like FanFiction.net. It has a limited number of file types it will accept – usually only .txt or .html. And, its formatting reacts differently to certain codes, making a chapter look very different from what most FanFiction.net user are accustomed to. Still, it’s not terribly difficult to post at an eFiction site; in fact, FanFiction.net even gives you the tools to do it! Click on My Stories link. Choose which story you want to post, and click on Edit. Click on the Content/Chapters link. 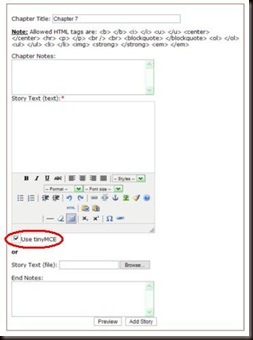 Choose the chapter you want to upload, and click on EXP. For those of you who don’t know this already, EXP is the Export function. It will create a copy of the existing chapter in the Document Manager. This is great for making corrections in the file, and allows you to reload the chapter without difficulty. Either click on the link provided at the top of the chapter listings, or go to the Document Manager. You should find your exported file there. If you go to the Document manager, you’ll have to click on Edit/Preview to gain access to the chapter. Now, at the far right of the editing tool bar, you’ll find a little button that says “HTML”. I have a picture that shows just where this is. Click on that. A new window will open up. This window will be full of your story and a bunch of HTML codes. It will all run together and be hard to understand. The key commands here will be: <p> (for paragraph), <em> (for italics), <strong> (for bold), and <br> (for line break). All but the last example will be canceled by another command: </p>, </em>, </strong>. Some versions of eFiction use <p> to not only mark where a paragraph begins and ends, but also to indent that paragraph. Lunaescence uses that variation. So, if you don’t want to have your paragraphs indented, here’s what you need to do. Right click on the HTML filled window. Open up a Notepad file. Paste the HTML into the Notepad file. Run a “Replace” using </p><p> and changing it to <br><br>. This will catch all but the first paragraph notation and the final paragraph cancel code. Remove those manually. Now, for pasting to eFiction. Go to either “Add New Story” or “Manage Stories” depending on what you’re doing. If you’re creating a new story, you’ll need to follow the directions on how to set it up. Don’t forget that you can use “Ctrl” to choose more than one character, genre, or type of story. If you’re adding to a story, then click on Edit after the story title. Once you’ve reached the chapter list, click on “Add New Chapter”. The page should change, showing you the edit box. Copy the material in your Notepad file. Paste it to the edit box. Now, Lunaescence is a moderated archive, meaning that your story will have to be checked for spelling and grammatical errors before it’s posted. Sites like FanNation aren’t, so your story/chapter should appear quickly. FanNation also uses a slightly different version of eFiction (which can be customized by the archive owner). 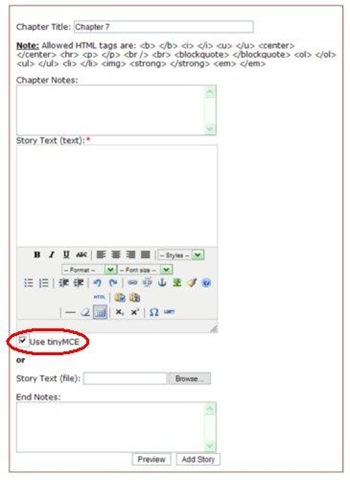 They use an editing function called tinyMCE, which allows you to just paste your story as it appears on FanFiction.net, without going through the HTML process. I really recommend that you do use the HTML, and that you click the checkmark off the “Use tinyMCE”. Why? Because if you’re posting to more than one site, as I do, then you only have to copy paste one set of commands. I also recommend you save the HTML in a .txt file. 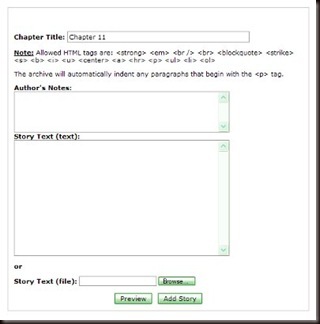 The eFiction software does allow for uploads of .txt files, which is closer to what FanFiction.net’s software does. Plus, if you plan on posting at a weblog, such as LiveJournal, you’ll already have the HTML for that. 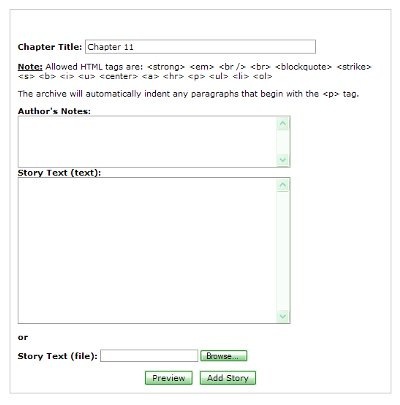 I use the HTML from FanFiction.net for formatting my chapters to post at my personal archive. So it saves a lot of time to actually save the commands. If you have any questions or comments, feel free! Previous Previous post: The Thunderbirds movie section at ff.net is gone!